Chuck Conway is a Pueblo native who has been making various types of art here in Pueblo for a long time. He has never shown his work. His work consists of found detritus, mostly metal, but other objects and materials work their way into his compositions. There are cast bronze and paintings on canvas as well as paint on metal. Discover the “silky, fibrous, and translucent” sounds of Texas duo Satin Spar, aka Andrew Weathers and Connor Sorenson. Bob Marsh will also join in on voice and electronics. Join us for a look back at the career and artistic journey of photographer and Pueblo native Jeffry Moore. Moore spent his early years as an advertising, fashion, still life, and editorial photographer in New York. He has been published internationally and has shown his work across the country, including an invitational portrait show at the Louvre. Opening reception is Friday, March 1st, 6-9pm. 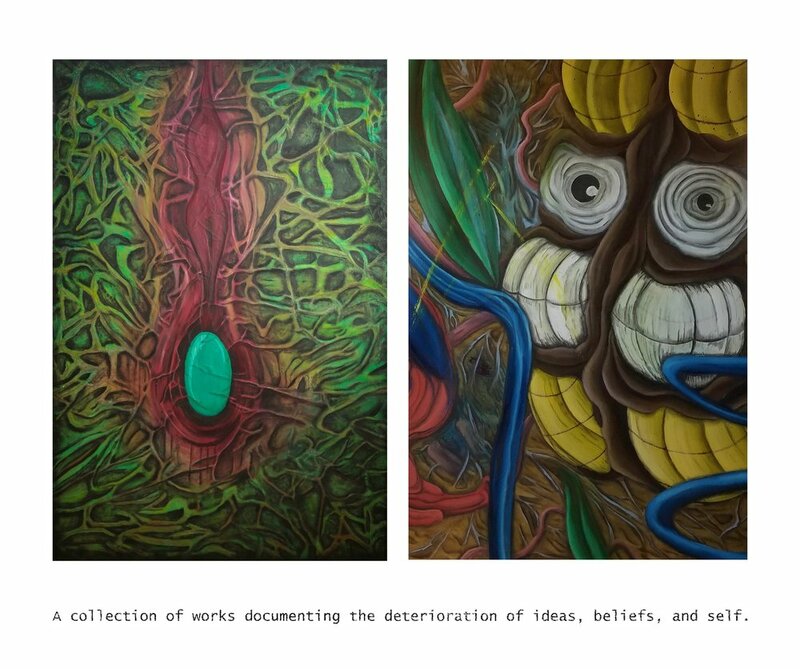 Closing reception Friday, March 29th, 6-9pm. Join us for the musical stylings of avant-garde artist and performer, Jaap Blonk. Blonk has traveled the world performing poetry, visual art, and music, and is known for dada-esque improvisation and sense of freedom. If you enjoy experiencing something fun and completely different, this performance is for you! Show starts at 7pm. Tickets $10. Second one-artist show by photographer Kevin Malella. Proceeds go to local nonprofit Soco Spay and Neuter. Inspired by the psychological complexity of Rorschach inkblot tests, Jhonn Pachak creates brightly colored pieces that explore the illusory relationship between painting and perception. Can you see clearly what others may not? Find out with Light, Lairs, Paintings, opening January 4th, 2019. This show and the gallery seem like they were made for each other. Lots of great colors that harmonize with each other in the paintings and the sculpture. Join us for the Opening Reception of 'A Collection: The Poster Art of Mathias Valdez' on First Friday, September 7, 2018 from 6-9pm. 'Mo' from Last Leaf on Union Avenue will share many of his celebrated posters from his collection during the month of September. Mo will be showcasing some creative new works which will be available for purchase at Blo Back Gallery. Join us for the Closing Reception of artist Matte Refic's show Surrendering Shadows. Festivities start at 6pm in the Art Grove. Thank you for supporting local arts in Pueblo. Join us on First Friday, August 3, 2018 for the Opening Reception of artist Matte Refic's new exhibition titled "Surrendering Shadows: Paintings Out of Darkness." Festivities commence at 5:00 pm and end at 9:00 pm. If you are familiar with Lucky the Horse, the Bear at Central Plaza on the ARTery, and the mural on the facade of the Sangre de Cristo Arts & Conference Center you have seen the large scale work of artist Matte Refic. 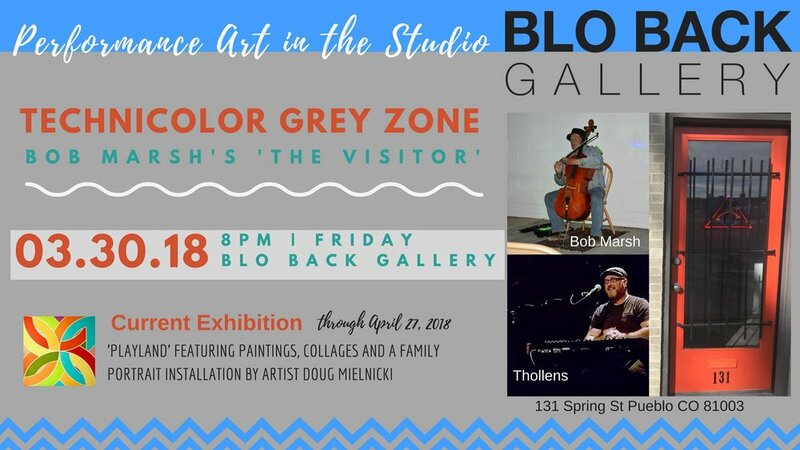 Now experience firsthand new works by one of Pueblo's most prolific artists at the Blo Back Gallery in the heart of the Art Grove. Join us for the opening of the Freedom Series featuring paintings by Bud Madeen from 1967 to 1990. The opening reception is on Friday, July 6, 2018 with festivities starting at 5:30 pm at the Blo Back Gallery located in the Art Grove at 131 Spring Street, Pueblo, CO 81003 USA. Join us for the Shoe Factory Group Show opening on Friday, June 1, 2018 at the Blo Back Gallery. Festivities start at 5 pm at the Blo Back Gallery located in the Art Grove at 131 Spring Street, Pueblo, CO 81003 USA. Artists' Programs at the Shoe Factory are designed to support artists, the creative process, and the development of new ideas and new work. These programs provide opportunities for research, experimentation, professional development, and peer-to-peer exchange and ultimately aim to foster creative breakthroughs and new modes of working and thinking. After one to three years of residency at the Shoe Factory artists are encouraged to establish their own independent creative enterprise in the heart of Downtown Pueblo and continue to connect with the community. 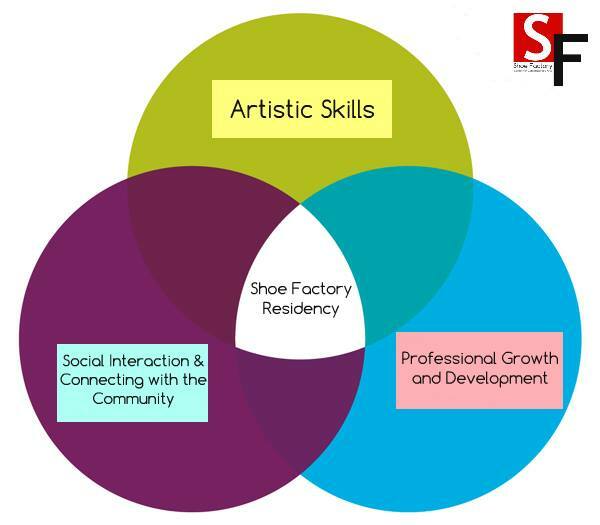 The Shoe Factory is a member-supported art atelier where arts, education and community converge. The founders of The Shoe Factory are artists, entrepreneurs and philanthropists. They have first-hand experience of the challenges that emerging and mid-career artists face as they develop their portfolios and build their careers. Their goal is to assist emerging artists as they take their professions to the next level and export the creative process to a broader community. Join us in celebrating artist Sam Ingo at Blo Back Gallery this Friday, May 25, 2018. Festivities begin at 6 pm. 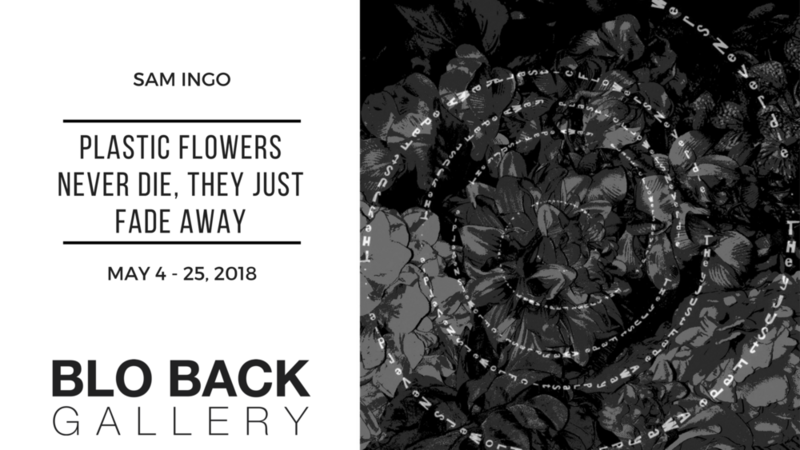 Please join us at Blo Back for Plastic Flowers Never Die, They Just Fade Away. Please join us at Blo Back for HIGH 5 - the Closing Celebration of Playland. 7 - 9 pm @ 131 Spring Street. Refreshments will be served. Join us on Friday, March 30, 2018 in the Art Grove for an exciting one night only performance art event. 'Thollem's Technicolor Grey Zone' is a multimedia experience pairing Thollem's live musical scoring to films. This year he's focusing on the films and video art of Martha Colburn (U.S./Holland), Tuia Cherici (Italy/France) and ACVilla (U.S.). Thollem has worked with each of these three filmmakers on various projects throughout North America and Europe including Maxxi Museum in Rome, Philadelphia Museum of Art, New Museum, SF MOMA, Crowley Theater, San Diego Institute of Art, Crystal Bridges, Toledo Museum of Art, Trinosophes, Pioneer Works, Northwest Film Forum, Sundance, Rotterdam Film Festival and more. This is an unforgettable show, bringing together the work of these 3 unique filmmakers with Thollem's Prophet and a microphone: jumping from an electric diving board into reality and imagination, landing squarely in the midst of the time of our lives at the center of a world on the edge. Marsh plays well with others such as Jim Baker, John Berndt, Tom Bickley, Jeb Bishop, Kyle Bruckmann, Gust Burns, Gene Coleman, George Cremaschi, Matt Davingon, Ernesto Diaz-Infante, Dina Emerson, Bryan Eubanks, R. Albert Falesch, John Finkbeiner, Tara Flandreau, Stephen Flinn, Jonathon Fretheim, Carol Genetti, Greg Goodman, Morgan Guberman, Greg Hamilton, Chris Heenan, Ron Heglin, Jeff Hobbs, Matt Ingalls, Kurt Johnson, Aurora Josephson, Andrew Lafkas, Adam Lane, Eric Leonardson, Jacob Lindsay, Fred Longberg-Holm, Toshi Makihara, Tatsuya Nakatani, Tom Nunn, Suki Oâ€TKane, Garth Powell, Bhob Rainey, Hal Rammell, Rent Romus, Scott Rosenberg, Jim Ryan, Joe Sabella, Jonathon Segel, John Shiurba, Blaise Siwula, David Slusser, Damon Smith, Adam Sonderberg, Karen Stackpole, Grant Strombeck, Tom Swafford, Ken Vandermark, Matt Weston, Sue Wolf, Theresa Wong, Michael Zelner, Michael Zerang. Donations are greatly appreciated to help support our thriving creative economy. The creative genius behind Denver's 'Big, Bad, Boy' solo exhibition at the Plus Gallery from 2004 - 2007, Doug Mielnicki, will be featuring a retrospective of his acrylic paintings along with new collage work on archival papers. Doug will also share a family portrait installation created for this show at the Blo Back Gallery. Originally from Pennsylvania, Doug made his way to Pueblo via Colorado Springs, Santa Fe and Denver. Join us on Monday evening, February 26 for the closing party of Kevin Malella's photography exhibition '365'. Refreshments will be served. Each image from the 365 show is available for purchase at $100 each. A portion of the sales proceeds will go directly to the SoCo Spay & Neuter Clinic. Thanks for supporting the arts and our animal friends. Wed-Sat 10:00 a.m. - 4:00 p.m.